When the two powerful forces Versace and Rosenthal met in 1993, only the extraordinary could happen. 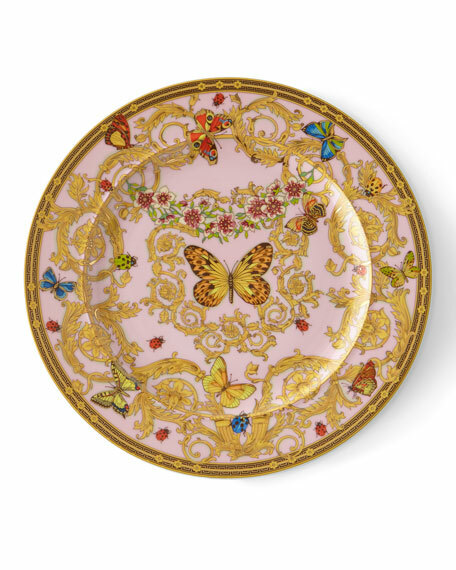 Rosenthal with its international reputation for uniting tradition and innovation, and Versace, with its own inimitable and expressive style, have developed tremendously elegant, luxurious and exciting tableware and gift collections. The Versace atelier is masterful at uniting the historical and the ultra-modern to arrive at truly timeless yet totally contemporary designs. For the creation of the most luxurious dream worlds, the Versace atelier has utilized only the highest quality. "Versace is a life style and for those who chose it, it must be an all-round choice", Gianni Versace never tired of repeating. As a master craftsman of experimental fashion, he was passionate and up-to-date, but always inspired by a multitude of ideas and subtleties suggested by classic culture. His universe of creativity was total. The provocative luxury of the infinite and ultra-modern color palette of Versace's prints was an explosion of the imagination: Animal textures and cool Petitot-style images, dazzling gold arabesques and Coromandel pagodas as well as Percier and Fontaine Greek patterns. Donatella Versace contributed new substance to the melting pot of Neo-classical and Baroque themes, resolutely interpreting them according to her feelings, her experience and sensitivity. Donatella has brought her fashion concept of bold mixing and matching plus unusual, striking color themes to the Versace Home Collection. It is she who now represents the essence of the Versace home-style.